6 Exhibit F: You get an icon, you get an icon, everyone gets the same icon! There's ridiculous. There's shady. There's borderline pathetic. 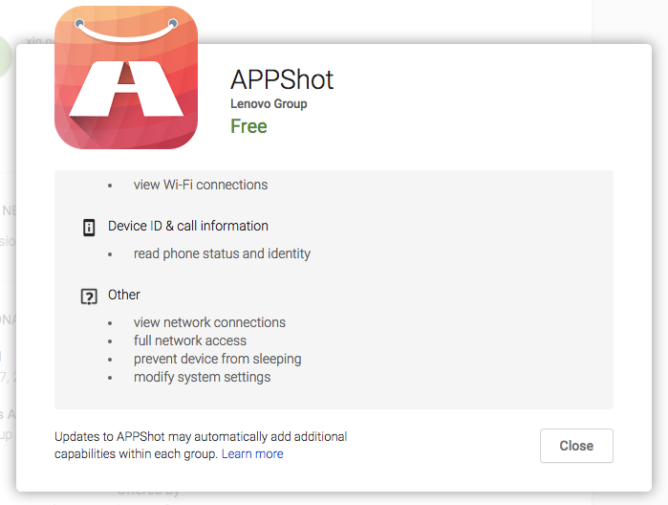 And then there's the new Lenovo APPShot listing on the Play Store. This one page, I swear, is a treasure trove of things that have gone wrong, driven past wrong, fallen off a cliff of wrong, drowned in a sea of wrong, and maybe even caused a cataclysmic explosion of wrong that resulted in a new astronomical black hole of wrong. There is so many applications for android. Do you know the trending ? There is so many Applications in the same category . Do you know which one suit for you? Punctuation: disaster. English: criminal. Shipshape: euhhhhhhhh... Thanks for noticing, I've been exercising and eating healthy . I would be willing to forgive the description text (after I closed my eyes and went into a zen mode for 10 days to try to forget all the infuriating mistakes there) because not all of us speak English as a first language and some have to use translation services. It's... borderline understandable, even if not so much for a global company that should afford to hire someone to write correct English for it. But again, I say, I'd be willing to let it slide if the recommendations inside the app weren't so damn pathetic. Screenshots are supposed to convince you to try an app by showing it at its best. 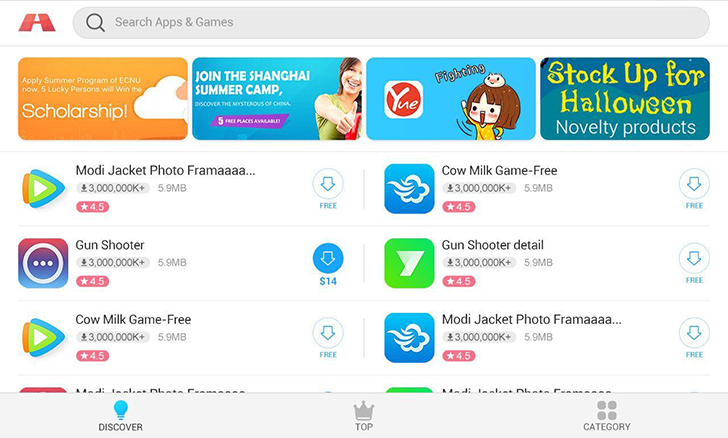 Yet for an app that should let you discover "exquisite apps" and get "hot and trending apps," giving suggestions like Modi Jacket Photo Frame and Cow Milk Game as shown in all the Play Store screenshots isn't a good start. Oh, phone status and identity, modify system settings, sure. Why don't you get a cushion and rest your potential spam comfortably inside my phone. I'll grab my data and we can see where this goes. Maybe notification ads at the end of the night. If we're lucky, lockscreen ads the next time around. Third date, we might go for data mining. Who knows?! The possibilities are endless. So I love you guys and all, but there's no way on earth I could install that app to check it out for real, not even on a phone I was going to expedite ship to JerryRigEverything after pouring gas and lighting it on fire. So I don't know what you really see inside the app. But the Play Store screenshots have even more priceless gems that you may have missed. Like Cow Milk Game-Free, which costs $14897.8. As far as I know, there is no dollar-based currency in which $14897.8 is free. Exhibit F: You get an icon, you get an icon, everyone gets the same icon! I'll leave this last awesome piece here for you to feast your eyes on. Modi Jacket and Cow Milk have the same icon. But Cow Milk has a different icon that's the same as another Modi Jacket. And Gun Shooter has two icons, because one of them is "detail." I'll link to the Play Store listing of APPShot below in case everything above isn't enough to convince you to avoid this app at all costs, or in case you're like those persons who slow down when driving past a car crash and can't fight the urge to see the disaster with their own eyes.